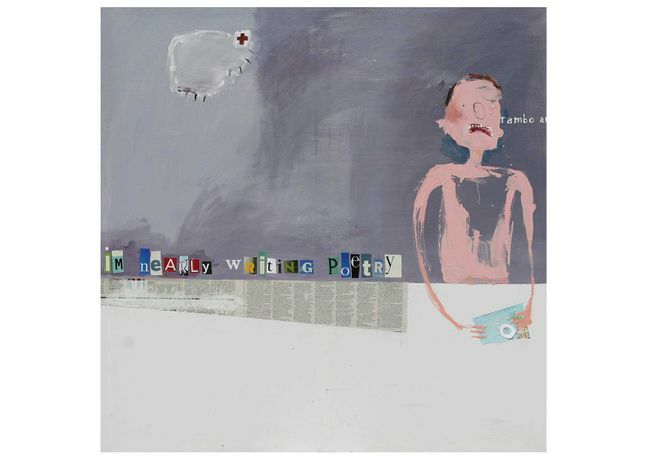 Amy Russell's narrative, autobiographical works combine paint and mixed media. They feature collages of mundane materials preserved from her day-to-day life to create striking, evocative and personal imagery with artistic intention. The works in âDon't Milk It' are about moments. Supported by meaningful titles, each piece has its own quirky story to tell. Through her work, Amy has developed a process whereby memories themselves are adapted, edited and shaped into a coherent personal history. The biographical details that the component elements of the works represent come from the experience and life of the artist herself. The integration of maps, magazine cuttings and collected paraphernalia from the artist's collection works to produce a reflective commentary on her own artistic development, one that also directs her stylistic decisions. The use of text and typography, cut from newspapers or printed with wooden type blocks, adds a strong graphical element to her compositions, and this too can be traced as a reference to her own history, and her father's occupation as a printer.